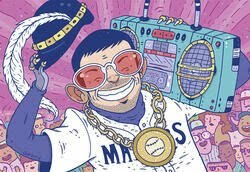 Great article about Mariner theme songs by FOTL (Friend of The Log) Damon Agnos in the Seattle Weekly. You can find it right here. Tough to beat Rich Amaral walking to the plate to Sweetwater's "Superstar." Damon has some great ideas of his own for the current squad. After watching Strasburg make mincemeat out of the AAAA Pirates, it reminded me of the Strasburg watch that went on here at the log. At the time, it looked pretty good that the M's would secure his services. That 3 game sweep of the A's to end the season was just a brilliant idea for a team headed absolutely nowhere. I'm ill.